On March 2nd the Premier of Ontario announced "Fair Hydro Plan" actions "cutting electricity bills by 25 per cent." The announced actions cut no actual costs. To the contrary, interest expenses are expected to climb to $1.4 billion annually, perhaps totaling $25 billion in the fullness of time. Perhaps $40 billion. My two previous posts have looked at rate components from a residential bill perspective, and an overall system supply cost perspective. I hope I have communicated that rates have risen substantially due to one small set of recently contracted supply, while nuclear and hydro provided the bulk of supply but little of the cost increases - and that not all consumer groups shared the burden of the rate increases. In this post I'll review the politics of recent electricity pricing policy decisions. "We feel that a lot of manufacturers are the middle child that are completely left out...They saw almost nothing in the recent announcements." It's been over 6 weeks since the government announced it's so-called "Fair Hydro Plan", and while some details will remain sketchy until enabling legislation/regulation is introduced, the overall intent is clear. 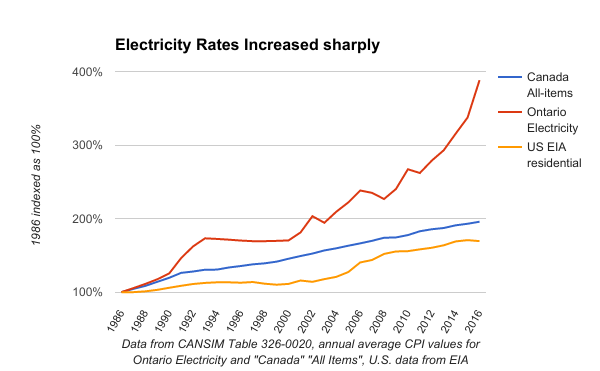 Ontario governments reacting to increases in electricity prices with rash programs to calm the populace are nothing new, but the current government's targeting of rate reductions is. The rate of 4.3 cents a kilowatt hour was the price at which electricity charges were frozen in 1994 by the New Democratic Party government. They remained at that level until May 1. May 1st, 2002 that is. The day the wholesale market opened in Ontario. The 1990's rate freeze was universal, and was accompanied by real cost-control measures - measures which, it can be argued, led directly to reduced generator performance and increased burning of coal, but certainly short-term cost-control measures. The 2002 rate freeze has been cited as ending the attempt to move Ontario to a competitive wholesale supply market. One complimentary measure was the cessation of the sell-off of Ontario Power Generation assets. Due to a Market Power Mitigation Agreement (MPMA), this measure had the effect of moderating rates for large electricity consumers - defined as using greater than 250,000 kilowatt-hours (kWh) annually. The Wynne government's Fair Hydro Plan is primarily aimed at consumers of less than 250,000 kWh annually, playing to the group of electricity consumers that will vote in 2018. Residential consumers are a smaller portion of provincial electricity consumption than generally perceived. 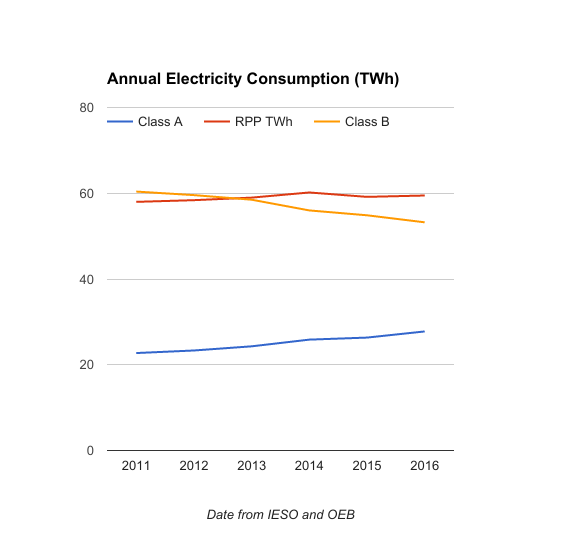 Since 2011 demand can be broken up into 2 to 3 main groups: Class A consumers have been very large consumers (greater than 5000 kW monthly peak consumption); Regulated Price Plan (RPP) customers consume the least supply and are charged a preset rate; Class B consumers pay a rate based on actual hourly consumption as well as a "global adjustment" charge levied monthly (on the basis of total monthly consumption). RPP consumers, including households, are a subset of Class B, but proposed policy changes make it convenient to consider the RPP consumers separately. Since the introduction of the Class A category, it has grown, and that growth appears to have come from Class B consumers moving into Class A status. The first element of the package to reduce costs to voters by twenty-five percent is the previously introduced rebating of the provincial portion of the Harmonized Sales Tax, which is meaningful for RPP consumers. Electricity was exempt from the Provincial Sales Tax that applied in the province until the introduction of the Harmonized Sales Tax for the second half of 2010. By the end of that year a panicked government had arranged compensating for the added tax with the rebating of 10% of the residential bill (dubbed the Ontario Clean Energy Benefit - or OCEB). That rebate ended with 2015 - with the subsequent uproar over increased costs in 2016 causing a panicked government to introduce the rebating of the 8% provincial portion of the HST tax for January 2017. While the government requires utilities to show savings on bills for the "8% Provincial Rebate", the tax has been charged for only 18 months throughout the province's history. Exemptions from the provincial portion of the HST, including the OCEB tool, have existed for over 6 years since the tax was introduced less than 8 years ago. Electricity was historically excluded from the old Provincial Sales Tax as a necessity - without previous governments advertising the exclusion on every bill. Also now on every residential electricity bill is a note: "Debt Retirement Charge exemption saved you $..." The charge was introduced prior to the 2002 price freeze, and removed from residential bills to start 2016. The timing was coordinated with the removal of Ontario Clean Energy Benefit (which was effectively a re-introduction of the provincial portion of the HST). No explanation was made, at the time, how it was possible businesses, and other Class A and B consumers, should pay for deemed debt from the past while residential consumers should not. The mainstream media's disinterest in the topic at the start of 2016 may have incented the government to further discriminate against businesses in the recently announced policies. After accounting for the already implemented rebating of the provincial portion of the HST, the Wynne government promises what amounts to a still substantial 17 % reduction in "people's hdyro bills." Not the bills of businesses - although some other actions will benefit Class A, and B consumers. The government has announced that social programs to assist rural residents and low-income Ontarians will move off of electricity bills. The rural/Remote Settlement and Ontario Electricity Support Programs charges added about $3.30/MWh (0.33 cents/kWh) to February Class A and Class B bills. All other things being equal, this would amount to 2.5% of wholesale market electricity rates. Many approve of moving social costs to taxpayers, but it's functionally relevant to note that historically rural rates were subsidized by all consumers. Prior to the breakup of Ontario Hydro in the aborted attempt to move to a competitive sector rates for rural residential consumers were to be no more than 15% above the rates for urban consumers. Anger over increasing rural "delivery" charges, like the introduction of provincial sales tax, has been both substantial and entirely predictable to those familiar with the history of electricity pricing in Ontario. Another policy redistributing costs among consumer types is the move to entirely fixed service charges for "delivery", eliminating volumetric elements. The policy was initiated within the Ontario Energy Board (OEB), and I firmly support it, but it must be noted the impact of the policy will be to lower costs for consumers of more electricity and increase costs for the most frugal consumers of electricity. Hydro One, the distribution company for most of rural Ontario, shows the greatest coming reduction in electricity bills will be recognized by farmers. The government also announced another lowered threshold for manufacturers to enter the Class A, or Industrial Conservation Initiative (ICI), program. The threshold was a peak of 5,000 kilowatts (kW) when introduced in 2011. Subsequently an Ontario court deemed the mechanism to be "designed by the government to provide a subsidy to large consumers", an appeals court agreed, and the country's highest court refused further appeals. Undeterred by the legal decisions the government has lowered the cap to 3,000 kW for some sectors, then for all sectors, then to 1,000 kW, and it is now intending to lower the subsidy qualification to 500 kW (only for manufacturing categories). Aside from inviting trade retaliation should the ICI spur a recovery, the program has grown from annually transferring about $300 million to Class B, and RPP consumers in 2011 to transferring nearly $1 billion in 2016. Because the mechanism shifts costs, the expansion means an erosion of the 2.5% savings Class B consumers would realize from moving social costs off of their bills. 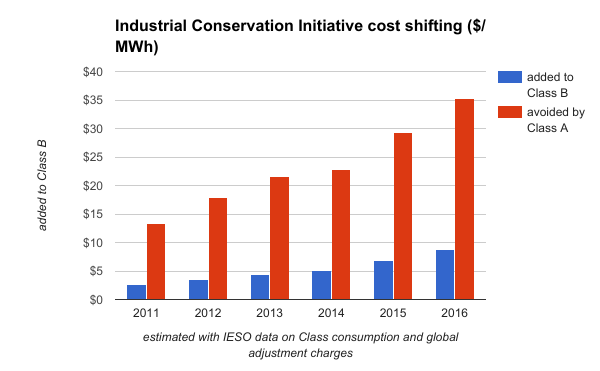 A consumer moving from Class B to Class A, had they achieved average savings exploiting the global adjustment mechanism, would have saved about $35 per megawatt-hour (MWh) in 2016. That Class A savings corresponds with a Class B cost. 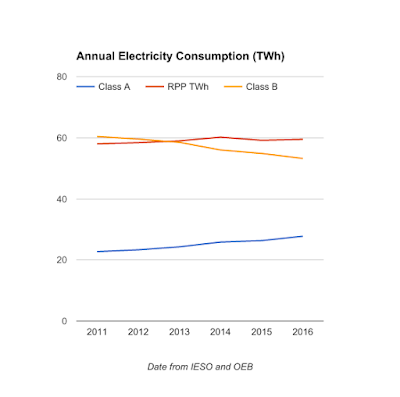 The recent changes are very significant for Class B consumers that consume enough to move up to qualify for Class A status - for existing class A consumers the changes are small ($3.30/MWh) and for remaining Class B consumers they are less than small. Residential, and small businesses charged under a Regulated Price Plan (RPP) are those being promised the steep cut in rates on their bills. The methodology remains unclear as no regulatory changes are posted, but the government presented it as a cut in the global adjustment. This is more than a little bizarre as these are the bills that don't show a global adjustment charge as a line item - unlike Class B and Class A invoices. Regardless, the speculation is a mechanism will lower the rate for electricity to RPP consumers with the mechanism being a reduction in the commodity RPP rates. In a post on the "Fair Hydro Plan" Bruce Sharp displayed sample bills with RPP rates reduced 3.4 cents/kWh, which is equivalent to $34/MWh. Recall I displayed the the benefits of the Industrial Conservation Initiative as essentially an equivalent amount ($35). The Premier's "Fair Hydro Plan" essentially offers the "subsidy" realized by big users in the Industrial Conservation Initiative to the provinces smallest users. If it all seems confusing, it may be because there is no actual cost reduction occurring - only cost redistribution. Class A consumers see lower cost because others see higher costs. Large RPP consumers, such as farms and homes heated electrically, will see lower service/delivery charges because others will see higher rates. Class B consumers moving into Class A status can see lower rates only if remaining Class B (and RPP) consumers see higher rates. Today's RPP consumers will see lower commodity rates today only at the expense of some other group, sometime in the future. The Premier implies in her words individuals in the future will bear the charges delayed by her "Fair Hydro Plan," but her actions indicated she'd rather future businesses/employers bear the burden. This was true in cutting the debt retirement charge only for Regulated Price Plan consumers. Electricity consumers of less than 250,000 kWh have Regulated Price Plan (RPP) eligibility. The customers who won't realize a significant break on the commodity pricing are therefore a strangely well-defined group of industrial and commercial entities consuming more the 250,000 kWh a year but not more that 500-1,000 kW as a monthly peak. Premier Wynne probably doesn't see her government as a bad boyfriend. I suspect that too is like a bad boyfriend. The [Market Power Mitigation Agreement] MPMA was put in place by the previous government when it tried to open Ontario's electricity market in May 2002, in order to prevent OPG from exploiting its dominant position as the majority supplier of Ontario's electricity. The MPMA structure was intended to be a temporary measure consistent with the previous government's policy of selling OPG's generation assets. - Since its inception, the MPMA has cost OPG approximately $100 million per month and approximately $3.3 billion in total. As a result, OPG has suffered poor financial performance over the last three years, and the government and taxpayers have not been able to realize any financial benefit from OPG. - Under the MPMA, all customers who use more than 250,000 kilowatt hours per year receive a rebate if the annual average Ontario electricity price exceeds 3.8 cents per kilowatt hour. This rebate applies to half of the electricity they consume. - Due to the MPMA, electricity prices for consumers have been effectively subsidized by taxpayers, and OPG has not been able to recover the cost of generating the electricity it produces. This has severely compromised the company's ability to improve its overall financial performance. One example of a cost to all customers is the rural rate assistance program. Under Section 108 of the Power Corporation Act, Ontario Hydro is required to maintain the difference between the weighted average bill for a year-round rural residential customer to no more than 15 per cent above the weighted average municipal bill. The funds required to provide discounts to qualifying customers are recovered from all electricity users. 3. There are exceptions to this rule. I understand much of the MUSH sector (municipalities, universities, schools, hospitals) is under different rules.